What does a candidate look for in an institution for pursuing MBA or MCA? Candidates generally look for all the above, not necessarily in the same order. Most of the institutes may be strong in few of the above whereas lacking in others. LBSIMDS is an institute which scores very high on all the criteria. As the famous saying goes “Seeing is Believing”, we analyse all the criteria for you. Institute’s Credibility: Established in the year 1982, Lal Bahadur Shastri (LBS) Group of Institutions is one of the oldest institutions in Northern India for imparting professional education, with a strong network of 22,000 alumni. Located on two separate campuses around Lucknow, LBS Group has carved a niche for itself and has successfully groomed and prepared thousands of management students for professional education. 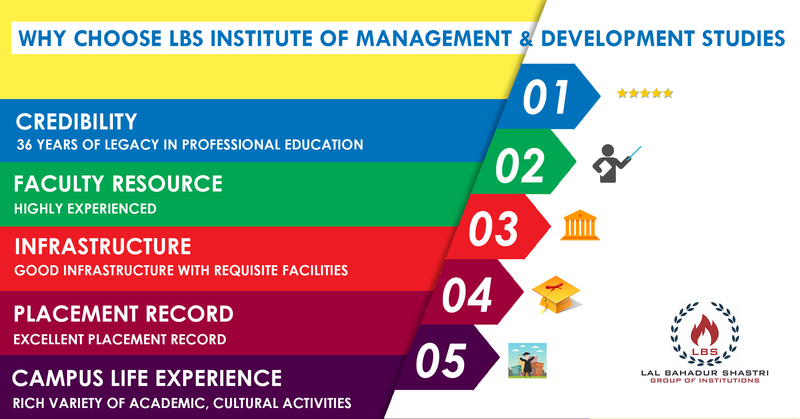 The institute values learning through innovation and experiential learning with over 65 Management Development Programs to choose from. Faculty Resource: We have a rich and diverse base of technical and management experts, highly reputed in their respective fields. The faculty is highly skilled, experienced and are PhD or NET qualified. LBS faculty is actively engaged into research work, book writing, publishing papers in leading journals, organizing and partaking in faculty development programs. Infrastructure: The infrastructure and facilities available on the campus demonstrate an environment for a scholarly education for the students, faculty and other staff members. The campus has big, bright, airy lecture halls with multimedia projectors, spacious libraries, computer laboratories, separate and secure hostels for boys and girls, spacious canteen and cafeteria along with 24x7 Wi-Fi connectivity throughout the campus. Placements: The institute has a well-organized Training & Placement Division, which keeps a constant touch with the industry. LBS Group of Institutions has an excellent placement record with over 5000 students placed in MNCs. Curricular & Extra Curricular Activities: Learning can never be limited to attending lectures, working on projects and reading books. Lal Bahadur Shastri Group of Institutions is a medley of numerous events of incredible experiences of people. And, for the multifaceted development of our students, LBSGOI fills their lives with a galore of activities within and outside the college premises.